Whether you're looking for a safe place to store your classic car, a luxury vehicle or just need to store a spare car where it's out of the way, indoor storage is considered the best option. Indoors, the car will be protected from weather elements and you can rest assured that it's safe and secure. Options that work for you – Do you need to store your car indoors in a facility, or outdoors, under a cover? Whatever option you choose Vines Storage can suit your needs. Lighting – Is the storage facility well lit, even at night? A brightly lit storage facility is preferable to one that is dark at night. Your valuable car will be at less risk if the storage unit is lit at all times. Access – Can you get to your car whenever you want to take it for a spin or look in the glove box for the important papers that you can't find anywhere else? Fast and easy access is available at Vines Storage. Security – Be sure that the facility is set up with security cameras and alarms. Vines Storage has a top-of-the-line security system with 32 cameras and alarms to help protect your property. Building condition – You're not likely to park a valuable possession in a place that's rundown or has a crumbling exterior, but look closely. Is the location clean and intact? By keeping these items in mind you can be sure that when you take your car out of storage it will look just as good as the day you put it in storage. 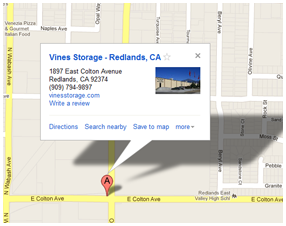 Vines Storage in Highland, CA, offers a number of options for those who want to store their car or recreational vehicle. You can be sure that your car will be safe, secure, and free from dust, dirt, and pests.